Don't worry, we don't like geometry as much as you do :) I guarantee nothing for this round, of course, we might have prepared such. Still you can check amount of these in our previous rounds. Did I miss some recent incident with a geometry problem? Or do you mean that both times Education Round had a geometry problem we had a lot of hacks (30 hacks were a lot back then...) / authors solution were not precise enough? 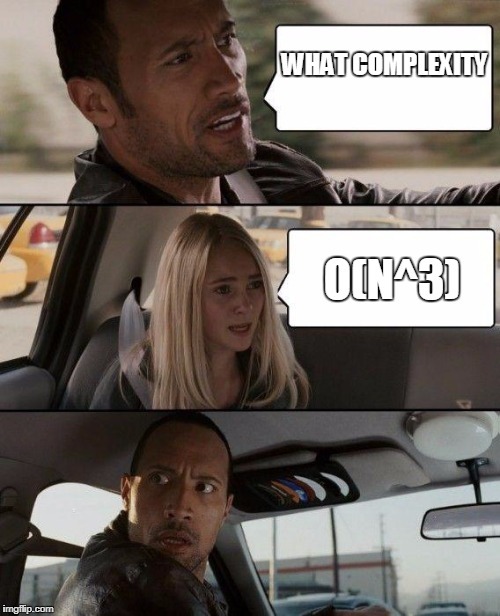 is there a way to solve that problem better than O(N3) ? I don't get what you're asking about. If we consider question "dot product >= C" then it is completely different problem. @swistakk Big-o notation describes worst-case complexity, so more like Ω(1) as a best case scenario. 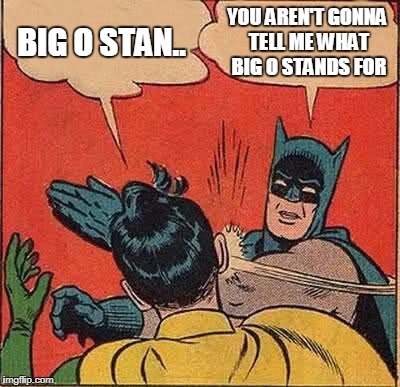 I know what big O stands for and I maintain my opinion that this task can be solved in O(1). Look, I'm not arguing for the point of arguing. It seems my knowledge of asymptotic notations is incomplete. May I ask why it's the upper bound? Running time of our algorithm for every n is bounded by constant which is running time for 11 points. Hence it's O(1). I am not sure you get what O(1) is here. What is complexity of algorithm that for an input of length n does respectively: 100, 234, 12, 1243543, 1, 78945673657578458567, 5, 5, 5, 5, 5, 5, 5, ... operations (I mean, 100 operations for n=1, 234 for n=2 etc.)? It's O(1), because it runs in time at most 78945673657578458567 no matter the value of n is. Now what is complexity of algorithm that does that many operations: 1^3, 2^3, ..., 11^3, 1, 1, 1, 1, 1, 1, 1, ...? It's O(1)! There no such complexity as "O(n) for n<=15 and O(1) for n>15", it's just O(1). Was it the AoPs one? I like that one. So is it rated or not? Why must unintelligent specimen like you plague our CodeForces community? Unfortunately, attention seeking exists in almost all communities. They will stop if you ignore them. I hope that today's round gives me feeling of competing on codeforces and not on geometryforces or implementationforces! We also have just discussed this topic. I plan to update all previous announcement blogs with this data after the results of current contest are up. Because hacking is illegal in my country! Can't get hacked if you don't solve! Can't wait the contest to end so I can watch people getting hacked by uwi! Don't worry guy contest is rate! UPVOTE ME PLZ! How to solve the f**k problem A??? Just solve more problems. It's the third time this problem appears on CF. 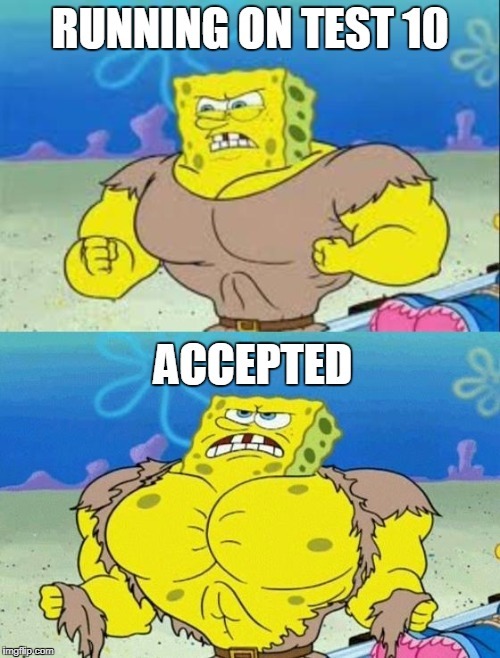 UPD: 180C - Letter, and the other problem is in Gym. can you send the solution? Here it goes! Here it goes! Let the hacking begin uwi! I've made simple dp on tree in E but fail. I assume that because of long long overflow. Is that good solution? It's because there should have also been problem G, just didn't have enough time to prepare it. Count number of ones after index i and number of zeros before index i. Now answer could be zeros+ones. Because zeros should be before ones. Delete all zeros before i. Delete all ones after i.
isn't that delete all 1s before i and all 0 after i. so at every iteration, I need to assume that its 1 and move accordingly?? Do not use cin in F!! But then i cant use printf safely. Did someone solve problem D with a 2D Segment Tree? It can also be solved with pure binary search. sort the times and binary search on the first event that makes the screen broken. in each check of the binary search, use a table of N by M and another dp one. fill it with 0's and put 1's on the places that were broken until that event. use dp to find in O(NM) the largest square completely made out of 1's. if its size is at least k, then at this moment of time the screen is already ruined, otherwise it's not. The problem F is too easy. It should be problem B. It seems that the checker for the problem F is incorrect. My solution got AC, even though the absolute error is more than 0.0001 on the testcase #15. (14792.348508-14792.3)/14792.348508 = 3.27926292e-6 < 1e-4. the statements says relative or absolute error, so in this case relative error is used. BledDest, you seem to have forgotten to add the editorial to contest materials, please add it so people can find it more easily. Thanks! Hey guys I can't figure out problem A why the answer of this input is "4"? input : 0 1 0 0 1 It seems maximum possible is 3 011 or 001 could you help me? Server time: Apr/26/2019 11:46:04 (g2).